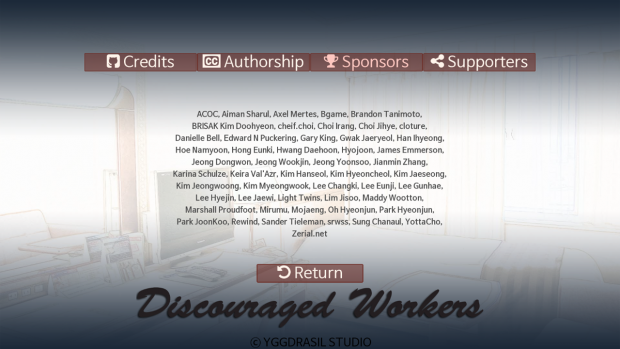 Post news Report RSS	Discouraged Workers Demo V2.0.0 Updated! 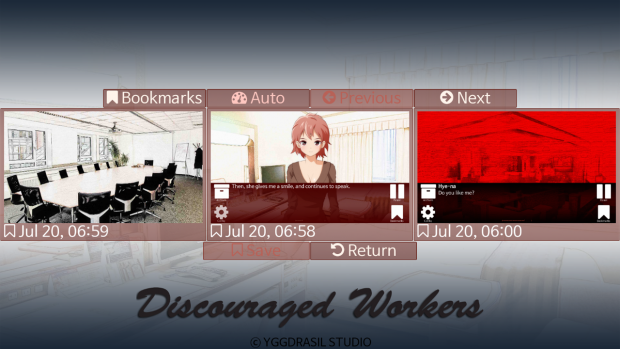 Discouraged Workers Demo updated on IndieDB and other many places! Thank you for your visit. 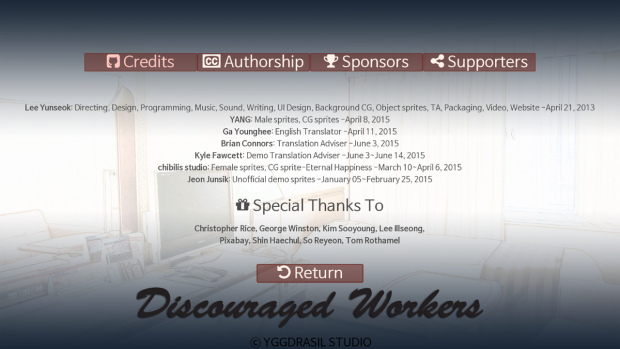 I’m Lee Yunseok, creator of YGGDRASIL STUDIO. 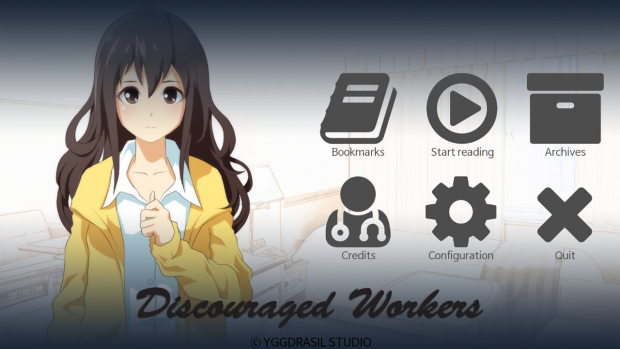 Today(July 20th, 20:00, PDT), I’ve updated the Discouraged Workers Demo. 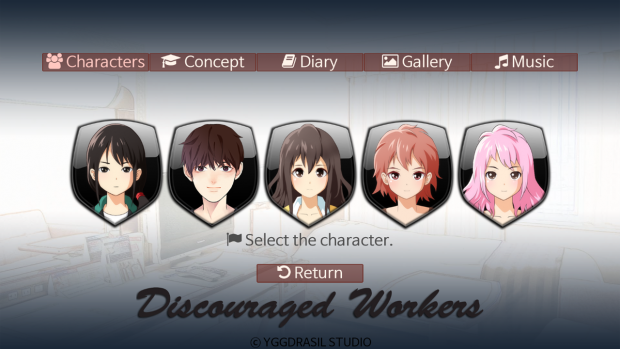 This is final update for Demo. 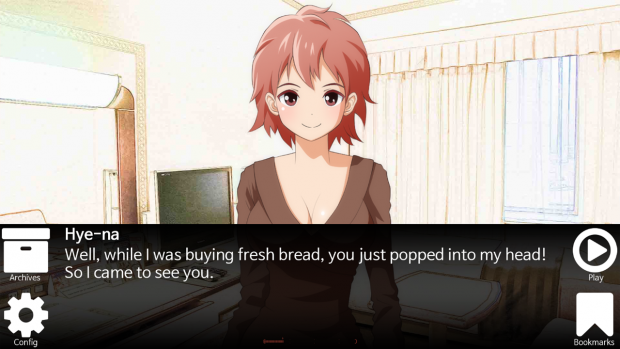 I added the Readback screen. If you missed any dialogues, or if you want to read the past dialogues, please use this. How to use it: Mouse wheel-up to activate the Readback. Click the Return button or Mouse Wheel-Down at the bottom on screen to inactive the Readback. If you mobile user, push the back button on your device. This is a new title screen. Illustrations are different from the beta version. This is a new part screen with slide dissolve effect. This feature will be added to the beta soon. This is a new Bookmarks screen. It’s the same as the beta version. This is a new Characters Archive screen. It uses the same style as the Steam Badges. And it will be added to the beta soon. 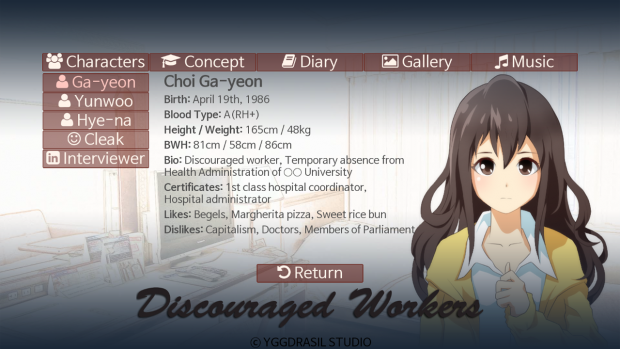 This is a new Characters Archive detail. It was advanced than the current beta version. And it will be added to the beta soon. This two screenshots are the same as the beta version. 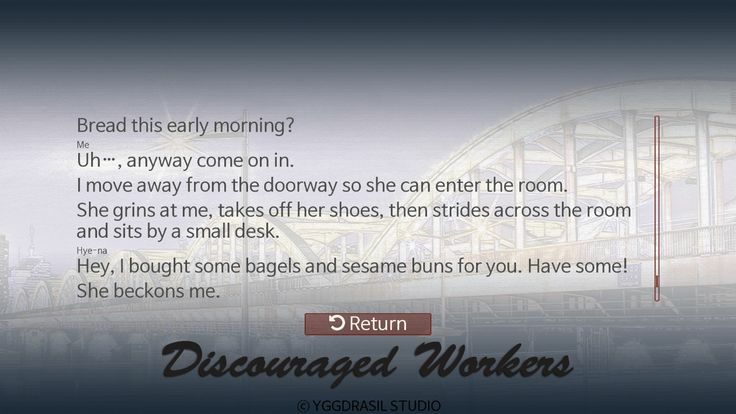 I changed the style of the dialog window. And it changed the position of the Quick Menu. Also, I was completely improve the problem of auto-play feature. This feature will be added to the beta soon. Before: A bell wakes me up. Before: The bell rings again. After: The doorbell rings again. Before: So, Ga-yeon, don't forget to give mom a call! Okay? After: So, Ga-yeon, don't forget to give Mom a call! Okay? Before: Then, I sit by the desk, take the money out of the envelope that she game me, and count it. After: Then, I sit by the desk, and open the envelope Hye-na gave me again. Wait, there’s more than one check in it! I look at the individual checks in the envelope and count them…. Before: My god…. one million won…. It’s too much…. After: My god…. There’s ten checks in here…, one million won…. It’s too much…. Before: After graduation, some of my friends got jobs, and some of them got married. And they have been living happily with their new family. After:After graduation, some of my friends got jobs, and some of them got married. And they have been living happily with their new families. Before: I’ve also had similar question at the previous interviews, and whenever I was asked, I lied. After: I’ve also had similar questions at the previous interviews, and whenever I was asked, I lied. Before: For a moment, I racking my brain to find the right words. After: For a moment, I rack my brain to find the right words. 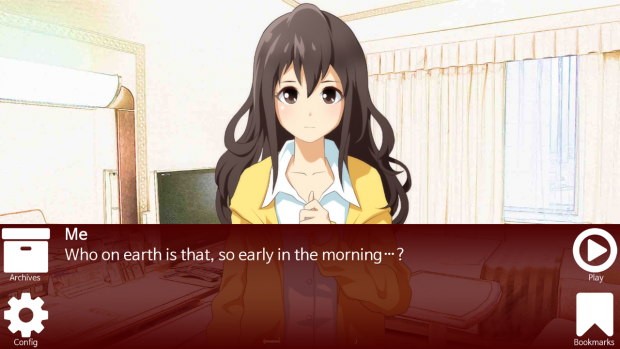 Before: Why did he appeared abruptly, even at that moment? After: Why did he appear so abruptly now? Before: Then, why haven’t you talked me for so long? After: Then, why haven’t you talked to me for so long? Before: You coffee is getting cold. You know that? Cold coffe is like an empty life. After: You coffee is getting cold. Cold coffe is like an empty life. Before: I sometimes don’t understand Yunwoo when he sometimes says weird things like this. After: I don’t understand Yunwoo when he sometimes says weird things like this. Before: That’s better. I crane my neck to see what he is point at. After: That’s better. I crane my neck to see what he is pointing at. Before: She was obvious trying to sell something like phone accessories. After: She was obviously trying to sell something like phone accessories. Before: At home, there were only Yunwoo and his sister lived alone, and that night, he was very anxious, worrying about his sister. After: At home, there were only Yunwoo and his sister living alone, and that night, he was very anxious, worrying about his sister. Before: And he took me to home, saying it was too late for a girl to go home alone. After: And he took me home, saying it was too late for a girl to go home alone. Before: Are you sure you didn’t see some other girl who didn’t just looked like Hye-na? After: Are you sure you didn’t see some other girl who just looked like Hye-na? Before: OK. I hope that what we are assume is wrong, and that she is fine. After: OK. I hope that what we are assuming is wrong, and that she is fine. Before: Yes, he visited me today, and now that I’m back home i’m calling you. After: Yes, he visited me today, and now that I’m back home, I’m calling you. Before: It’s been two years since I’ve became jobless. After: It’s been two years since I became jobless.